Artificial grass means that there is no need for fertilizers, mowing or watering, and it can be cleaned with a brush or with a non-metal rake or broom. This premium synthetic grass area rug is great for indoor and outdoor use, such as runner rug, doormats, garden, patio, balcony, swimming pool, terrace, park, villa, pet dog area, etc. 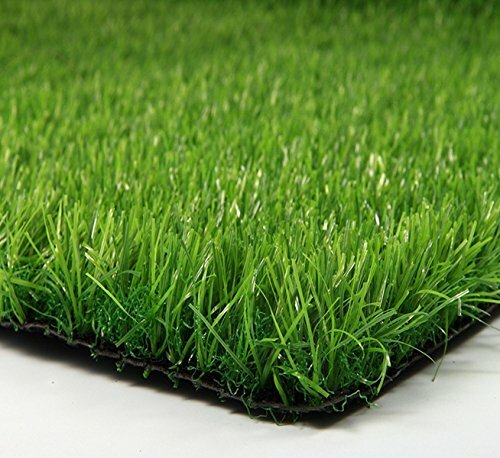 The blade of this artificial grass rug is about 1-1/5 inch (30mm), can be cleaned and washed easily. Our synthetic turf adopts Eco-friendly material and will not release toxic chemicals. Welcome to purchase our synthetic grass from Synturfmats! When you receive the artificial grass rug, the blades of the grass may inclined or flattened as it was rolled in the package, you can lay down the grass rug in the sun for a few hours, and stroke the grass backwords with your hand or a comb. There are little debris attached on the grass rug, you can shake the rug to remove them. Artificial grass rug can be used indoor and outdoor, such as runner carpet, doormats, garden, patio, house decoration, kindergarten, roof, pet dog area, etc. Our premium synthetic turf rugs have a light and very natural appearance, it's soft and looks and feels like real spring grass. Eco-friendly and Long lasting. Does not release toxic chemicals, fade and wear resistant. Perforated with drainage holes. The blades of this artificial turf is about 1 1/5" (30mm), which is moderate, Can be easily cleaned and washed. PLEASE NOTE: 1.there maybe a few inches deviation as it was measured and cut by human. 2. When you receive the artificial grass rug, the blades of the grass may inclined or flattened as it was rolled in the package, you can lay down the grass rug in the sun for a few hours, and stroke blades backwords with your hand or a comb. 3. There are little debris attached on the grass rug, you can shake it outside to remove them. If you have any questions about this product by Synturfmats, contact us by completing and submitting the form below. If you are looking for a specif part number, please include it with your message.